Democrats regained control of the House of Representatives on Tuesday, far exceeding the required 15 Republican-held districts needed for a majority, as voters demonstrated their disapproval with the Iraq war, President Bush and scandals in Congress. The victory ends 12 years of Republican rule of an institution that had become plagued by bitterness and scandal, and clears the way for Rep. Nancy Pelosi, D-Calif., to become the country's first female House speaker. Democrats won 28 seats previously held by Republicans, giving them a 230-198 lead with 7 races left undecided, according to CBS News. Also, with Georgia Democrat Jim Marshall's successful defense of his seat, the Democrats have lost no House seats in the 2006 election, CBS News reports. The last time a party did not lose a House seat in an election was 1938. President Bush called Pelosi with congratulations Wednesday morning after Democrats took firm control of the House. Pelosi said she told Mr. Bush she was ready to work with him. "The success of the president is always good for the country, and I hope that we could work together for the American people. He said he thought that would happen and we would talk about it over lunch tomorrow." "You could make the case that this is an opportunity for Bush," says CBS News political consultant Norm Ornstein. "The first reaction after Democrats were wiped out in '94 was that it would be the end of the presidency for Clinton, but it ended up being a savior. Things got done. It gives Bush an opportunity to create a majority in the middle. Now, he has to take advantage of this opportunity, but Democrats have a strong incentive in getting legislative successes, especially because many won by small margins in Republican territories." Pelosi said she had also spoken to the man she will replace, current Speaker Dennis Hastert, R-Ill., who she said was "very gracious" in defeat. "I said, 'You know, I enjoyed so much giving him the gavel that I was looking forward to him having that pleasure.'" The election results give Democrats power in the House for the first time since 1994, when a rebellious GOP captured 54 seats to end a four-decade reign by Democrats. Pelosi will be formally re-elected as her party's leader, and its nominee to be speaker, when the Democratic caucus meets on Nov. 16 to choose its standard-bearers for the next Congress. Meanwhile, Democrats took control of GOP Senate seats in Ohio, Pennsylvania, Rhode Island, Missouri amd Montana, according to CBS News. Democrats would only need to take the remaining seat, Virginia, to assume control of the Senate. Ornstein notes the challenge facing Democrats in this new Congressional power balance as they deal with President Bush. "Bush will have to work with Democratic leaders who don't like him and don't trust him. And the feeling is mutual," Ornstein says. According to CBS News exit polls, voters said national issues outweighed local ones by roughly 2-to-1. Exit polls showed that nearly 60 percent of voters disapprove of the Iraq war. And despite recent controversies with high-charged political attack ads and continuing revelations in the Mark Foley scandal, most voters said their minds were made up at least a month ago. Pelosi represents one of the most liberal districts in the nation and is notable for her sharp criticisms of the Bush administration. 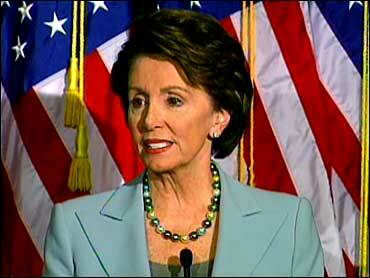 "Pelosi will have a full-time job just keeping her caucus together. The Democrats are badly fractured on fundamental issues," says CBS News Democratic political consultant Harrison Hickman. "The leadership is very much further to the left than the members." As results came in on Election Night, CBS News said the 15th and clinching seat win for Democrats came in Florida with Tim Mahoney's defeat of Republican Mark Foley, whose name remained on the ballot even though he had resigned several weeks earlier when it was revealed he had sent inappropriate e-mails and IMs to a House page. Scandal also played a role in Democrat Nick Lampson's capture of former Republican House Majority Leader Tom DeLay's seat in Texas. DeLay left Congress following his alleged involvement in the Jack Abramoff-lobbying scandal. However, Republican Tom Reynolds of New York, a key figure in the page scandal, avoided defeat, beating out Democrat Jack Davis. Overcoming his staunch support of the Iraq war — which proved a powerful handicap among many Connecticut voters — incumbent Republican Christopher Shays managed a slim victory over Democratic challenger Diane Farrell. The first pickup of a Republican seat was in Indiana, where county sheriff Brad Ellsworth was the winner over GOP incumbent John Hostettler, a leading voice for social conservatives who was first elected in 1994. Also, Nancy Johnson, Connecticut's longest-serving House member, lost her re-election bid and five-term Congressman Jim Ryun, R-Kan., lost his seat. Former NFL quarterback Heath Shuler, a Democrat, defeated Republican Charles Taylor in North Carolina and Iraq war veteran Patrick Murphy beat Republican incumbent Michael Fitzpatrick in Pennsylvania, CBS News estimates. Republican Richard Pombo of California was defeated by Democrat Jerry McNerney. "The old era of irresponsibility is over, and the new era of real reform has just begun," declared Rep. Rahm Emanuel, the Illinois Democrat who oversaw his party's House campaign. Republicans spent months trying to beat back well-funded Democratic opponents in districts stretching from New Hampshire to California. In the campaign's homestretch, Democrats widened the battlefield by going after Republicans in states that historically have been solid GOP territory, including Arizona, Indiana, Iowa, New Hampshire, North Carolina and Kansas. Scandals that have dogged Republicans appeared to hurt Republican incumbents even more than Mr. Bush's unpopularity and the nearly four-year-old war in Iraq. Republicans surrendered the Ohio seat once held by Bob Ney, who resigned after pleading guilty in a lobbying scandal. In Pennsylvania, Democrats defeated both Curt Weldon, who was caught in the fallout from a federal corruption investigation, and Don Sherwood, who admitted to a long-term affair with a much younger woman who says he choked her. All 435 House seats were up for grabs Tuesday. "We're seeing a huge turn in independent voters to the Democrats. National exit polls show a significant advantage for Democratic candidates," says CBS News political consultant Stu Rothenberg.